Notes in English, Deutsch, Fran�ais, Italiano.� Photos of composer and artists. Roberto Cani, v; Jeffrey Swan, pft. Arkadia AK 143. It�s not so unusual for a composer to be best known for a very untypical work.� For instance, Ravel is best known for Bolero, Tchaikovsky for his Nutcracker Suite, Vivaldi for the Four Seasons, Bach for Air on the G String, and Brahms for his Hungarian Dance #5.� Until he wrote Fountains of Rome in 1913 Respighi was known as a pianist, violin virtuoso, composer of passionate lyrical violin music, arranger of �ancient music� for small modern ensembles and a highly skilled exponent of modal scales and archaic harmonies. �Pines of Rome, by which he is best known today, appeared in 1924 before Mussolini had taken complete control of Italy.� Feste Romane from 1929 was Respighi�s last large orchestral work and represents the extreme use of jagged polyrhythms and acidic polytonality in his music.� Some see in this music an accommodation to fascism, others see a viciously satirical work � la Shostakovich.� Respighi never sought the approval of the fascists and on one occasion angered Mussolini by signing a public manifesto urging greater respect for traditional forms in music.� In 1931 Respighi was diagnosed with heart disease and from then until his death five years later he put all his diminishing energy into smaller works and generally unsuccessful stage works. The D minor sonata was written during earlier uncomplicated days when Respighi was 18 and still a student in Bologna, but demonstrating his already profound grasp of instrumental sound, violin and piano, at both of which he was extraordinarily proficient.� It begins with a brilliant tune full of adolescent passion and never lets you go.� The work is in three movements concluding with a lighthearted scherzo. The first four of the Six Pieces are all songs of one sort or another � Aria, Melodia, Serenata, Berceuse � followed by a �valse caressante� and a �leggenda,� although the Serenata is rather dramatic, and #3, Berceuse, is as much a Valse Caressante as #4.� Each has a distinct personality, a sense of spontaneity, and they appear to have been written down upon a moment�s inspiration over a period of several years.� Any one of them would make a fine recital encore and the set of them makes a tray of delights. The last movement of Respighi�s B minor sonata is a passacaglia, sounding remarkably like the Busoni Violin Sonata #2 written some nineteen years earlier (indeed the Arkadia recording is coupled with this work) and which has a set of variations on a Bach Chorale as a final movement.� The sound of the Claves recordings is somewhat constricted, sounding like a small room. The Arkadia recording offers richer, closer sound - and extempore embellishments in the slow movement of the Busoni. 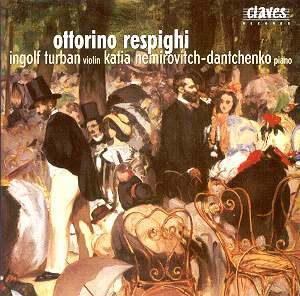 If you don�t otherwise have the Busoni work it�s a fine coupling.� But the Claves recording contains three works by Respighi, the first two of which are world premier recordings and is the essential choice for the Respighi.� Sensitively supported by pianist Nemirovitch-Dantcheko, violinist Turban adopts a tense, vibrato and rubato rich sound entirely appropriate for these works which are played with brilliant, consuming passion.� Cani and Swann wring a little more drama from the passacaglia final movement.